Dried out skin, rash and even sometimes other allergic reactions can be seen with use of a powerful and potent acne treatment. However, this is obviously not ideal. No matter how bad your acne is, it probably isn’t worth additional irritation and reactions in order to get the clear, clean face you’re looking for. X-Outclaims to be a one-step treatment from the makers of Proactiv that works by using natural ingredients for effective treatment without the harmful side-effects that many times accompany acne treatments. Let’s take a closer look and see if this formula is able to produce effective cleansing results as promised. As mentioned above, X-Out is made by the same company that produces Proactiv, the popular acne cleansing treatment. It can be used as an acne cleanser, by washing into the face both morning and night, a spot treatment by applying directly to problem spots that arise and a mask to be left on for at least 10 minutes at a time. •	Linoleic and Linolenic Acids: essential fatty acids that are used as moisturizers along with Glycerin. •	Menthol: to provide a refreshing, minty zap. Even though these ingredients have not all been individually tested and proven to work to perform the above mentioned functions and the product has not been proven as a whole through clinical trials, there are many consumer reviews from teens, like yourself, that talk of the results seen with use of X-Out. We are frustrated by acne treatments that are too expensive for teens to purchase on their own. We would prefer a treatment that teens can purchase without the help of their parents. 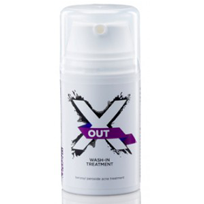 XOut retails for only $19.95 on the product website, putting it easily in the price range of the average teen consumer. Additionally, X-Out comes with a 60 day, no questions asked, money back guarantee which offers additional reason for teens to trust this product and its manufacturers. As mentioned briefly above, the ingredients are all natural and it seems that with little effort on your part you can find various consumer reviews available so that you can see what other users have to say about the product. There have been a few reports of side-effects with use of this product. Users with skin sensitivities report slight stinging and irritation and there have been some additional reports of dried out skin. Most users would recommend using a moisturizer with the product. In order to avoid this, we would recommend speaking to your doctor or skin care professional before purchasing this product for yourself. We would prefer to recommend a product that has more scientific evidence of results. However, it seems that X-Out is a good product that is backed by consumers and a satisfaction guarantee and, as a result, we would suggest giving it a try. SCAM-BEWARE! !Purchased XOut,a friend recommended it, for my 12yr old. Has acne on face/shoulders. Used the product for a couple weeks, no improvement in acne but had serious redness on face so we decided to discontinue. Then another package showed up. You are automatically set up for 90 day shipments and billed every month for it. I called & asked for return and they sent me a Return Merchandise Sticker no problem. HOWEVER, I immediately mailed product back in original unopened box and they have continued to bill my credit card ($98.82)instead of refunding. Now they claim they never received my return blaming the USPS and refusing the refund! So much for the 60 day money back guarantee. It was in their box with their RMA sticker! I reported to BBB. Same experience as the other customers regarding the ongoing billing. I called on December 23 to complain and continue to be billed. I shudder to add up the total cost of this product. Beware! I purchased X-Out and the back wash for my 15-yearold grandson who had acne in some areas on his face and back. He did not like the multiple steps of the previous “systems” he had tried. The first few times his face did get a little red, but it faded quickly. Since then his initial acne (face and back)are all gone and very few are showing up. Because it is one step, he is faithful about it. Several of his friends have not started with it and all have had remarkable success. I meant that his friends have “now” (put not in prev msg) started using it. Do NOT get duped into trying this product. My son has been using it for awhile now and haven’t seen any major results. The company gets your debit card information for the 1st order and continues billing you even if you cancel the product. They are also not up front with the total cost and sucker you into paying for 3 months at a time. I tried to cancel again today and the rep sounded like a total robot reading from a script and totally unwilling to help refund my money. I will NOT order this product again. have blemishes, pimples and worse than ever before. Finally I convinced her it was the product and she has stopped using it and we have canceled our auto delivery. Now to get her beautiful skin back to where it was. I highly caution any young girl or boy that uses these products and make sure they do not react to the strong medications in them before they use it all over their face. A few blemishes with her cycle is easier to handle than the wreck this product has turned her skin into. I am so upset company, not only did this product not work they still keep charging me for this item that I sent back! I have nothing good to say about this product and that they are nothing but out to make money and make money only. To all do not buy this product. I have sent this product back and was told they would not charge my account and they lied about it..DO NOT EVEN WASTE YOUR TIME WITH THIS COMPANY!!!!!!!!!!!!!!!!! They did the same thing to me. They told me they took my card off file and a couple of weeks later I got more of the face wash sent to me so I checked my account and I had $102 charge from them! I had to cancel my card after talking to them for about an hour getting nowhere… SCAM!! They did that to me many years ago I had to call my bank and they had to flag my account so no more payments came out. Purchased XOut to help with my 12 year old daughter’s acne. She doesn’t have cystic or major acne, but regular white heads on forhead, nose, chin. We had been using regular Proactive, but she didn’t like all the steps, which is why I chose to try XOut. In the 10 days she’s been using the product her nose has gotten considerably worse – lots of bumps and white heads as if the skin is just rebelling against the product. I am very disappointed to see her acne worsening with use (and we have used it as directed) instead of improving. Will NOT recommend this product – smells bad too. We are discontinuing use and sending it back.